Explanation: Early morning risers and late to bed astronomers have recently enjoyed bright planets in predawn skies, with brilliant Venus above the eastern horizon. On November 5, Venus was joined by the waning crescent Moon. This self-portrait by astronomer Larry Ciupik captures the lovely pairing of the two brightest celestial beacons on the scene, though the Moon, right of Venus, is strongly over exposed. Included at the far left in the 30 second exposure is the bright streak of the International Space Station still docked with shuttle orbiter Discovery. Together in Earth orbit, the spacefaring combination was momentarily the third brightest sky light in view. In dim silhoute, a multi-mirrored unit of the Very Energetic Radiation Imaging Telescope Array System (VERITAS) is also visible in the foreground. 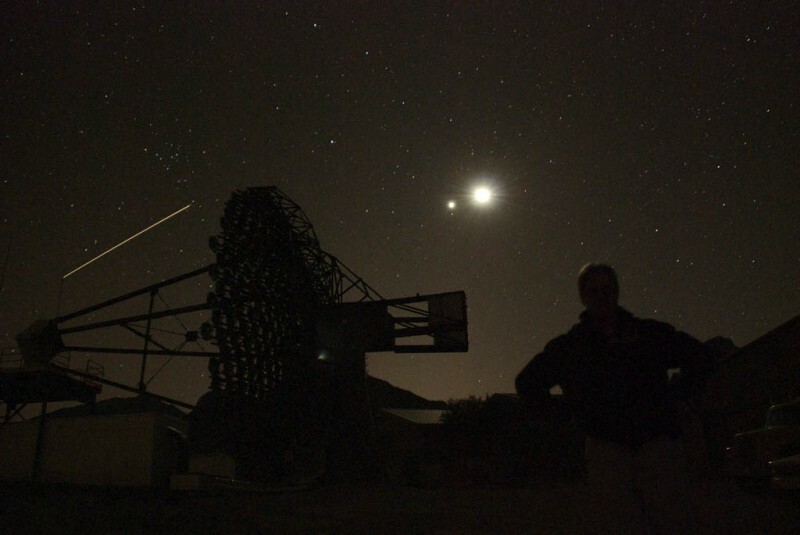 VERITAS operates at the Whipple Observatory near Tucson, Arizona to detect high-energy gamma-rays from the cosmos.